Eagle Rock in the Hickory Nut Gorge area is along the new 8.6-mile Weed Patch Mountain Trail. 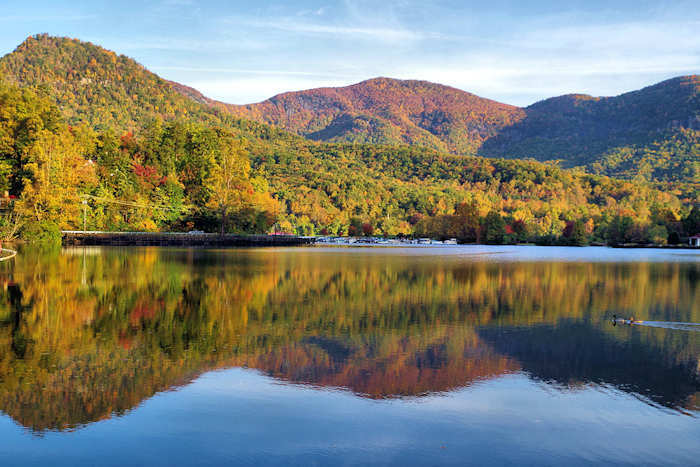 The new trail connects with the Buffalo Creek Trails in Lake Lure, making it a one-way 10-mile bike or hike adventure. You'll gain almost 3,000 feet in elevation, so it's a strenuous hike. 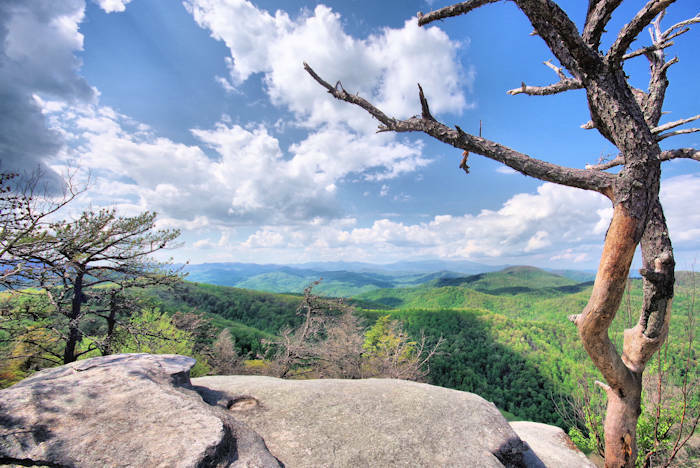 Eagle Rock is located just inside the Chimney Rock State Park at 3,400 foot elevation. From the summit, look north toward Mt. Mitchell and Grandfather Mountain. On a clear day, you can look east all the way to downtown Charlotte. It's more than 2,000 feet in elevation above Lake Lure below. Thanks to Peter Barr and Conserving Carolina for building this trail. It's a rare trail that opens backcountry adventures for hikers, mountain bikers and rock climbers. Weed Patch Trail traverses rugged mountain terrain through a remote wilderness area. Along the way, find rock outcrops with long range views, pristine mountain streams and an old growth forest. The trail creates the first access to Eagle Rock. A spur trail takes rock climbers below the rock face. New in Fall 2018: If you want to bike and hike one-way or rock climb at Eagle Rock, you can now park at the Chimney Rock State Park trail end of Weed Patch Trail. The small parking area on Shumont Road off NC Highway 9 is limited to 8 parking spaces by reservation only (free). From there, it's about a half mile to Eagle Rock. This parking area is accessed through a locked gate. At the time of registration you get a combination for the gate. You are responsible for closing and locking the gate behind you. The road to the parking area is a one-way gravel logging road which may be difficult if you have a vehicle with low ground clearance. Trailers and vehicles larger than a 15-passenger van are prohibited. Each registration is good for only one parking space per day. No overnight parking. For questions about this access, please call 828-625-1823. Reserve online here.